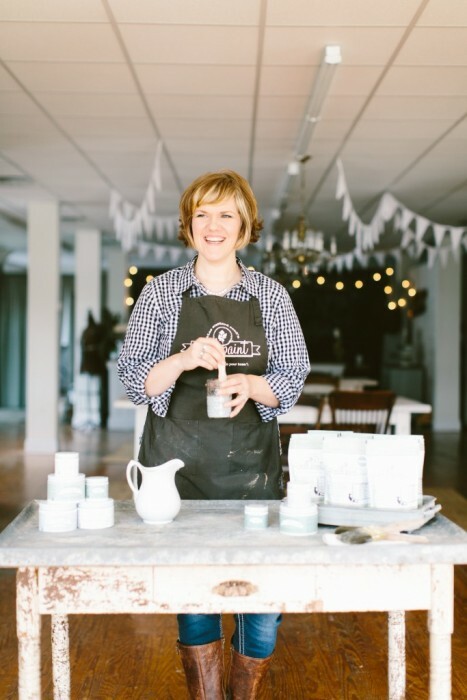 In part one of this series, we talked about what milk paint is. Now, we’re going to get into mixing, which I think is the most intimidating part for most people. First of all, we’re not use to mixing paint, right? It usually comes in a bottle or can and it’s already a liquid. Just dip in your brush and go. I must admit that the convenience of that is nice. 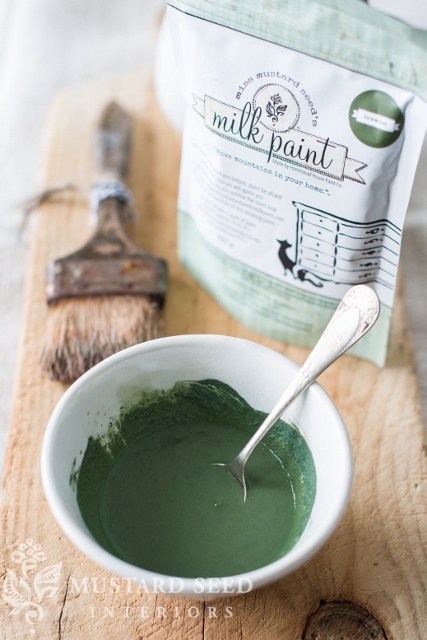 The reason milk paint doesn’t come that way, is that it is perishable once it’s mixed, so it’s sold in powdered form. I think some people are nervous about mixing the paint because it is an unknown. And most of us are a little apprehensive when we stray from what we’re used to. There’s also an assumption that this needs to be exact or everything will be ruined. So, let me first put you at ease. If you can stir, you can mix milk paint. It’s very forgiving and very hard to mess up. Before we get into the step-by-step of mixing, let me give you an analogy that I often use in workshops. Think of milk paint like peanut butter. Remember the peanut butter most of us grew up with? The processed, artificial-ingredient-laden peanut butter that would have a perfectly smooth and level top no matter how much the jar was shaken? The peanut butter that would make stiff peaks on a knife and perfect waves on a piece of bread? That is like modern paints that have all kinds of things added to it in order to make them smooth and creamy, so they fall off a paint stirrer in a perfect ribbon. You then decide to kick all artificial ingredients from your diet and you switch to all-natural peanut butter. You open the jar and frown. It looks clumpy. There is an oil slick on top and it needs to be stirred and worked to make it creamier. That is like milk paint. It doesn’t have all of those additives that modern paints have, so it looks different. Neither paint is wrong or bad, they are just different. If you expect them to be different, you’re less likely to freak out when milk paint is, well, different. There are many different ways to mix milk paint, depending on your preferences, but I’m going to share how I mix 90% of the time. Pour desired amount of milk paint into cup, jar or container. 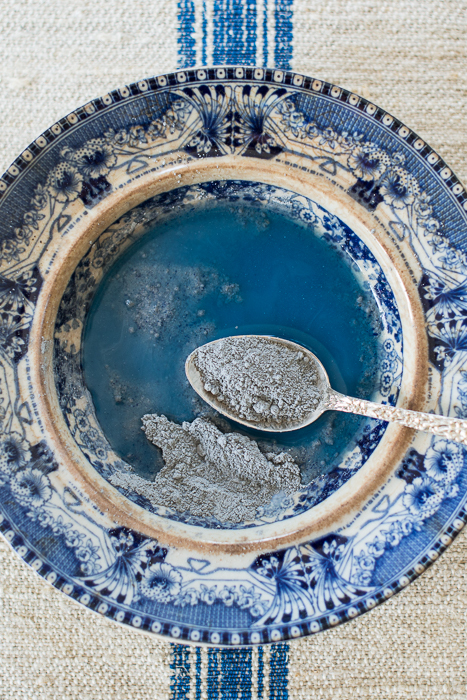 If you’re painting a small piece of furniture or an accessory, I would suggest 1/4 cup. If you’re painting a dresser, about 1 cup. Add equal part water. If you put 1/4 cup powder in your cup, add 1/4 cup water. 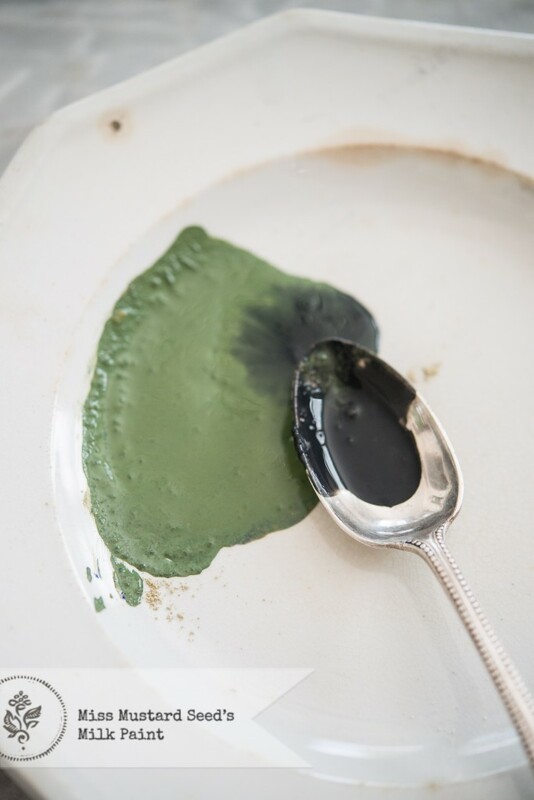 If you’re mixing a large batch or a challenging color (see below), then use a blender, immersion blender or MMS Milk Paint Mixer (a milk frother). Add more water, if necessary. For some colors, equal parts is enough and for others, it will be too thick. The consistency should be thinner than most paints you’re used to. It will feel watery more than creamy and it will come off your stir stick in a string instead of a ribbon. Allow the paint to sit for about 15 minutes. This gives clumps of powder a chance to absorb the water. Stir again. It should feel a little creamier. There might be a few lumps or some grit clinging to the sides of the cup. This is totally normal, so don’t stress about a few small lumps. Brush the paint onto the surface you wish to paint. This is the best way to tell if your mix is right. 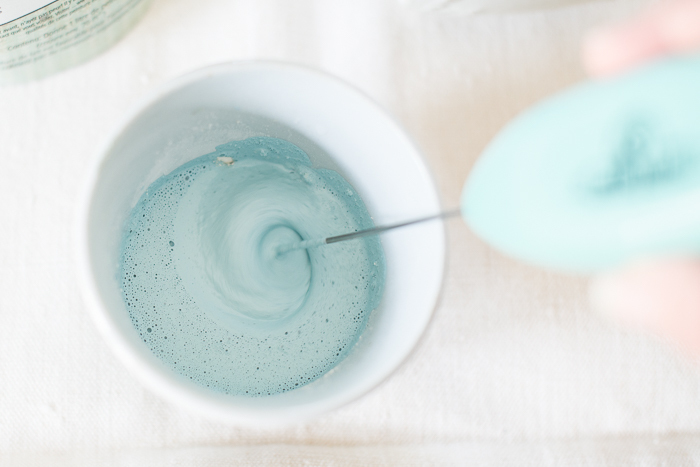 If your brush is dragging or there are a lot of lumps, the mix is too thick and needs more water and more stirring. 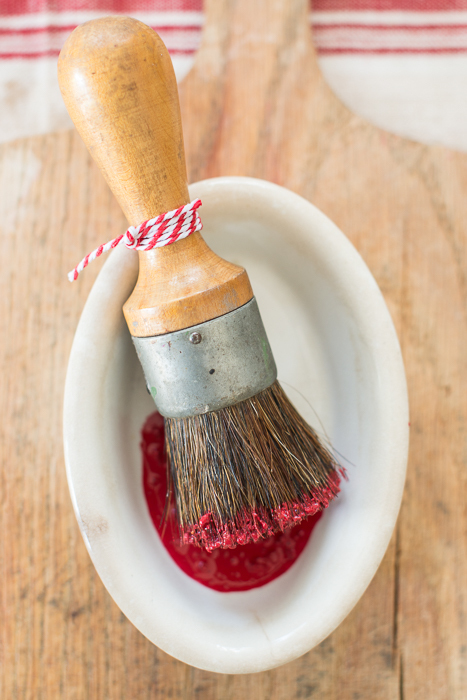 If the paint is runny or dripping, it’s too thin and you need to add a bit more powder and stir again. If you want a video tutorial with more detail, here’s one we made over a year ago when Kriste was just learning how to use milk paint. The thickness of the paint really is a preference thing. If I’m painting raw wood, I’ll mix it thinner, because it will soak into the grain of the wood. If I’m painting something with an existing finish or paint, I’ll mix it a little thicker, since it will be sitting on top of the surface. It should always flow nicely off the brush, though. Different colors mix differently. I have found that the lighter colors usually need less water. Tricycle (red) is the most challenging color to mix, since the red pigments resist the water. This is a perfect color to use an electric mixer on or to shake in a lidded jar. It will come together, if you mix it by hand, but if that’s the first color you ever mix, just know that most colors mix easier! The pigments in some of the colors separate, especially the ones with yellow and blue pigment, like Boxwood. This can be problematic if you’re painting a larger piece and don’t stir a little as you go. The paint will look more yellow or more blue towards the end, resulting in a splotchy, uneven look. This won’t happen if you give the paint a little stir, even just with your brush, every ten minutes or so. The kind of water you use can make a difference. I use ordinary tap water, but if you have well water or really hard water, you may want to consider using bottled for mixing your milk paint. You may find that the paint thickens as you use it. That is because the brush is drawing more water out of your cup or container, so you may need to add a little more water and give it another stir. Once mixed, the paint can be stored for about a week. Just cover it with plastic wrap or a lid and keep it at room temperature. When you’re ready to use it again, mix it and add some more water to bring it to the right consistency. You can mix two or more colors to make custom colors! I like to mix up small batches, writing down the “recipe” until I find the color I want. If you have any questions about mixing MMS Milk Paint, please leave them in the comments section below. You can find a local or online retailer HERE. Next time, we’ll talk about prepping different surfaces (raw wood, different paint finishes, poly, wax, etc.). 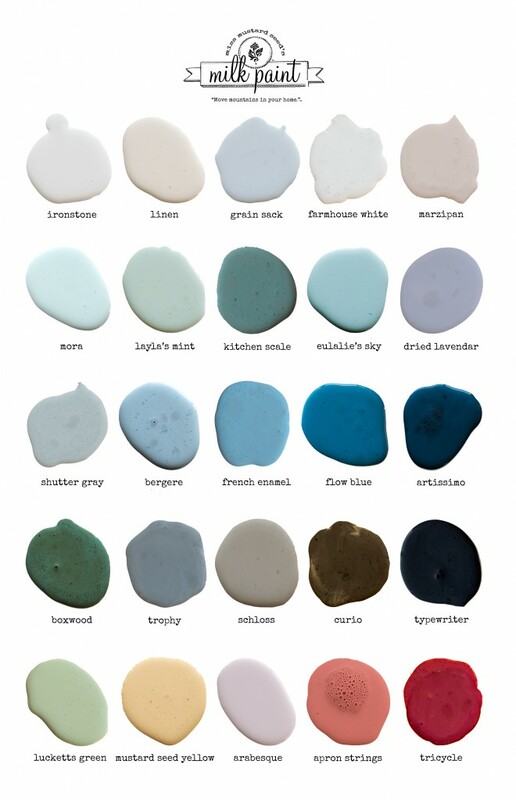 And, I thought this would be a good time to show off our new color chart! Kriste and I made it by mixing each color and putting a “blob” of the paint on a white surface. My assistant, Heidi, put these “blobs” in a graphic. I love that it shows the actual color and each blob has a little personality. And, you can definitely see how much I love my blues, greens and grays! Five ingredients. 25 gorgeous colors. This entry was posted in Milk Paint 101, Mixing Milk Paint on 1.24.16 by marian. I have a Chinese bench that has a dark brown finish which is coming off due to cleaning. This is no an expensive antique so I would like to try my hand at giving it a tricycle red finish. Do you have any samples on this color over a dark finish? Do I understand correctly that there is no prep work involved? Sounds too good to be true! I’m painting a table and chairs with the mustard seed yellow, and no matter how much I stir, it goes on very clumpy and leaves the surface rough. We have done 2 coats and it looks like we need 3 because it’s not going on very well. So my guestion is, what am I doing wrong? I’ve read this page, watched the videos and still can’t get a smooth coat. Did you ever figure it out? I’m using Arabesque and no matter what method or how long I mix it, it is still grainy. Sometimes the little clumps burst open as I paint leaving white or yellow streaks. It’s so interesting, thank you for sharing! I see you often use a cup or bowl to mix your paint. Can the paint be washed out of the cup and the cup reused? If it was glass or glazed ceramic? I would understand if I can’t reuse it to eat out of, but at least I could have one “paint mixing” cup and not have to buy and keep cups for every color on hand. I’m definitely looking into the hemp oil. the idea that I can use one product for my furniture and cutting boards and cast iron AND old leather shoes is mind boggling.